We offer visitors a very warm welcome to The Old Mill, Torloisk which we have completely modernised and renovated. We have one luxurious bedroom available. 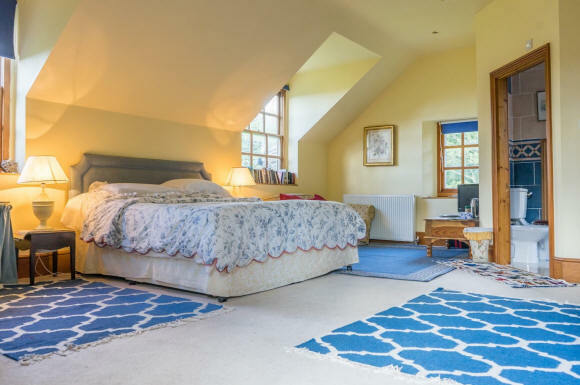 This bedroom runs the whole width of the house, is extremely large with a super-king-size double bed, a bed settee and an ensuite bathroom! To find out more just click here. We pride ourselves on the quality of our breakfasts, and we use local and organic produce whenever we can. We are happy to cater for special diets. Just let us know. We'd recommend that if you are coming to stay that you book your evening meal in advance at one of the excellent local restaurants - you'll find more about them here. You can find more details on The Old Mill, Torloisk, Isle of Mull by using the menu on the left or below. The Location page gives advice on how to find us, including a new way to get a precise location.